This week, I’m excited to announce the release of my first solo project — a webinar series — on a platform I’ve created called how to: academia. how to: academia is a brain child that I’ve dreamed up to help academics be more successful. It’s a platform that will house an annual webinar series with a different theme each year. It’s also a long-term investment for my side business, so I’m both nervous and excited to see what others will think. I believe in this project and its ability to help academics, but I’m launching with both fear and anticipation. Because putting yourself out there is always a bit hard. To help mitigate some of the fear, in this first year, I’ve chosen to focus on one of my favorite topics and also one that I see academics consistently struggling with: writing and publishing. This is also a topic that I love to talk about, and one that I feel super comfortable with since I’ve consulted with faculty in a wide range of disciplines on writing and publishing for years. Many of these webinar topics are ones that I’ve presented in face-to-face workshop settings at colleges and universities all over the U.S. so I’ve had plenty of practice! Each webinar will have a 45-minute interactive presentation, 15 minutes of Q&A, and will come with a slide deck and bonus resources. Once the live presentation of the webinar is done (and there are two live options for each one), a re-play video and transcript will be made available. I decided to get creative with the purchase options for this project, so people have the opportunity to purchase individual webinars, purchase individual webinars for a group, buy the whole series, or purchase an institutional membership for an unlimited number of people. One of the most fun parts of this project for me was creating the course space to house the webinar bonus materials and re-plays. Each person who purchases anything in the series, whether an individual webinar or the whole shebang, will be able to log in to a course space where they can access the materials once the webinar is over. But I’m not complaining. Because it’s completely worth it. The hours, days, weeks that I’ve spend preparing this project have been full of joy, nervousness, and anticipation. I can’t wait to facilitate these conversations, answer questions, and provide resources to current and future faculty, higher education professionals, and anyone else who want to learn more about writing and publishing in the academy. And, of course, I’ll keep you updated on this project’s progress over the coming year. 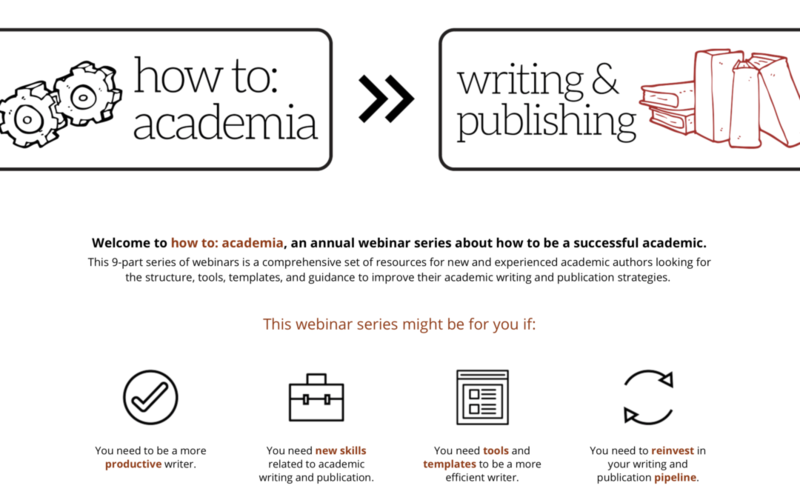 I’ve provided plenty of links above if you want to check out the how to: academia webinar series, but I’m also thrilled to share a discount code just for The Academic Creative readers that will get you 20% off any of the individual webinars (an $8 savings), the entire series (a $62 savings), the group webinars (an $80 savings), or the institutional membership (an $800 savings — not too shabby!). Just use code tac20 when you check out to get the automatic discount. I hope you’ll check out the website, and also pass it on to any friends or colleagues who might be interested in the webinar series (feel free to pass on the discount code as well!). You may also see some advertisements for the series on various social media feeds in the coming weeks — if you like and share these posts it will go a long way in helping me spread the word. Thanks in advance for supporting this new brain child and for your continued interest in my creative projects — I hope to see many of your friendly faces in the webinars this year! When was the last time you felt a serious mix of anticipation, nervousness, and excitement? What professional development do you have planned for the coming year?